Chia is an edible seed from a desert plant called Salvia hispanica, which is grown in Mexico. Chia means strength and the history of eating it can date back to the Mayan and Aztec cultures. It is believed that the two cultures used black and white chia seeds as energy boosters. This folklore sounds true because chia seeds contain calcium, fiber, omega-3 fatty acids, protein, carbohydrates and antioxidants. They are whole-grain unprocessed foods. One ounce or 2 tablespoons of chia seeds contain 9g fat, 11g fiber, 19 calories, 12g carbohydrates and 4g proteins, vitamins and minerals. It is easy to add chia seeds to beverages and foods because they have a mild, nutty flavor. They are sprinkled on baked foods, rich dishes, cereal, yogurt, vegetables and sauces. They are mixed into drinks and with water to form a gel. Add a few tablespoons of chia seeds to cooked oatmeal. You can add them to any other grain porridge and overnight oats. Add chia seeds to smoothies if you do not like the seeds’ gelatinous texture. The seeds add a crunchy raspberry-like flavor to smoothies. Add nutrients and satiety to regular or Greek yogurt by sprinkling chia seeds. Prepare a pudding using regular milk or your favorite no-dairy milk and chia seeds. This light, tapioca-like pudding can be mixed with nuts, fruits, or eaten plain. Click here to learn more recipes and specific directions for chia pudding. You can add chia seeds to fruit juice if you like their texture. You can add chia seeds to any dish including applesauce. Remember that chia seeds form a gelatinous texture when mixed with liquid. Sprinkle them on your dish just before you eat if you prefer a crunch. Some ready-made pouches have chia seeds as a primary ingredient. Such pouches may contain a lot of sugar but are excellent snacks even for kids. Blend chia seeds with stevia and berries to prepare a homemade jam. You do not need to add pectin because chia seed form enough gel. Chia seeds are excellent gluten-free, healthy breading for vegetables, meat and fish. Blend them with your favorite spices and finely ground nuts to replace breadcrumbs. For more chia baking recipes, click here. Chia seeds are rich in antioxidants that protect delicate fats in the seeds and prevent production of free radicals. The radicals can damage molecules in cells and contribute to diseases like cancer and aging. Antioxidant supplements have minimal effects on health compared to antioxidants in foods. One ounce of chia seeds contains 12 grams of carbohydrate and 11 of these grams are fiber. This means that chia seeds contain only 1g of carbohydrate per ounce, which makes them a low carb. Chia seeds can absorb 10-12 times their weight of water and they will expand and become gel-like in the stomach thus increase fullness and slow food absorption, which reduces your calorie intake. Chia seeds contain a higher amount of quality protein than most plants. 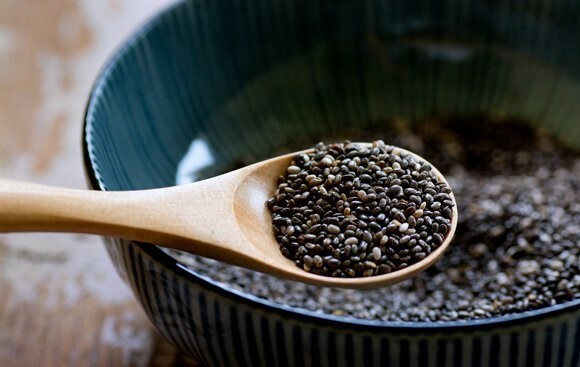 About 14% of the weight of chia seeds is protein. Chia seeds have a good balance of essential amino acids, which have health benefits. Proteins are beneficial during weight loss because they reduce appetite and desire for food and nighttime snacks. One gram of chia seeds contains more omega-3 fatty acids than one gram of salmon. However, chia seeds contain ALA omega-3s, which must be converted in EPA and DHA to benefit the body. The human body is inefficient in converting ALA. Hence, plant omega-3s are inferior to animal sources. Learning how to eat chia seeds is essential for your workouts. Chia seeds help athletes to improve their endurance while decreasing their sugar intake and increasing the nutrients intake. Past studies have shown that chia seeds can be used in place of Gatorade to improve athlete performance. Chia seeds have potential health benefits but pose some risks when they are not eaten properly. The seeds should be consumed in their dry, raw form. Mix them with enough liquid and allow them to expand before eating them. This caution is very important for people who have suffered swallowing problems before and those with a constricted esophagus. Individuals with known esophageal strictures and a history of swallowing problems should only eat the seeds after they have expanded fully in liquid form. Chia seeds can cause an obstruction if they expand and form their gel in the esophagus. Removing the gel from esophagus is difficult. Anyone who cannot swallow foods, saliva or beverages after eating chia seeds should see a doctor immediately and one must learn how to eat chia seedsproperly to avoid such complications.